Hello! Thanks for joining us to take part in this interview! [UWoS]: No problem guys, thank you for interviewing us! Could you tell us a little about your team? [UWoS]: We are a husband and wife team. Sarah and James (Woody) Woodrow, based in Cambridge UK. Woody works full time in the shed at the bottom of the garden doing all of the things (coding, animating, modelling). Sarah helps in her spare time with things like designing the characters and interfaces. Our friends Team Doyobi helped us with the amazing soundtrack. How long did it take to develop Chompy Chomp Chomp Party? [UWoS]: As there was only one full time person we were impressed that it only took us about 2 years! It was a huge learning curve and we needed to iterate on the game design a lot. Why did you decide to develop a party game for the Wii U? 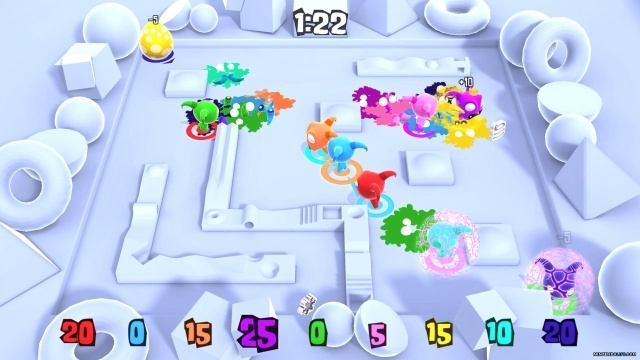 [UWoS]: We made the original Chompy Chomp Chomp for up to 4 players on Xbox 360 and PC. To us a Nintendo console was always our ultimate dream of what to develop for and when we figured out we could have up to 9 players we just HAD to make Chompy Chomp Chomp Party. What is the objective in Chompy Chomp Chomp Party? [UWoS]: Each player is a Chompy. Under the feet of your Chompy is a target that is the colour of another Chompy. That indicates who you need to run towards and CHOMP. 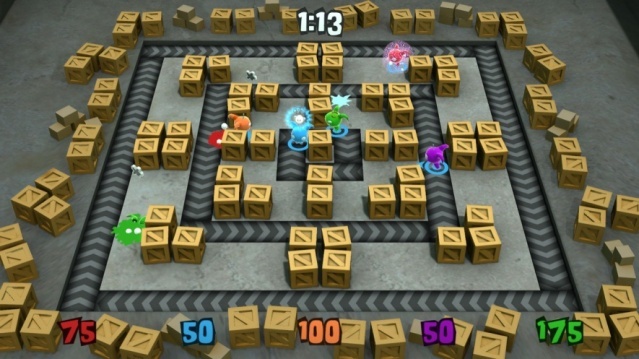 There are 3 different modes; one where you each chase one other person while being chased called Chase and Chomp, one called Zone Dash where one player runs from zone to zone to gain points while everyone else chases them and one called Keep the Thing where one player has to keep the thing for as long as possible while everyone else tries to chomp them to get the thing. We’ll be adding more modes as we invent them! It is a simple yet crazy and intense game that anyone can pick up and play and you can all sit around and scream and shout at each other. How many players can play the game at a given time? [UWoS]: Up to 9 Players, you can share your controller attachments with another player. You can even get up to 5 players with just 2 controllers and 2 nunchuks. It works with any controller combo really. It really appealed to us that it would be so easy for Wii U owners to play it multiplayer as with any other platform you would need to buy a lot of controllers to be able to play. 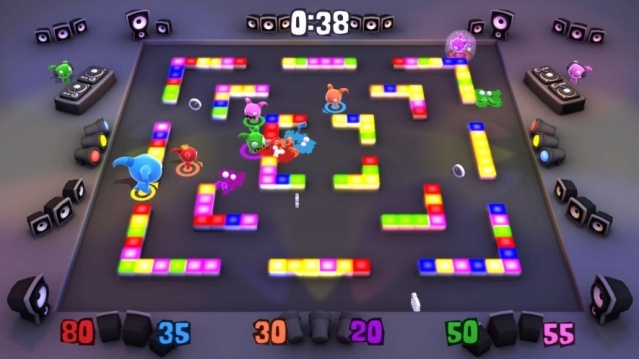 What games were your biggest inspirations for Chompy Chomp Chomp Party? [UWoS]: When we talked about making a game we wanted to create something that reflected the best times we’ve had playing games and we realised that it was getting a bunch of random people together to play something. We loved the multiplayer games of the Gamecube/Dreamcast era, we would play them with our friends all the time. So games like Billy Hatcher, Bomberman, Chu Chu Rocket and Super Monkey Ball are big inspirations for us. We like the simplicity and accessibility of retro games like Pac-Man and ended up wondering about what a multiplayer Pac-Man might be like. So really we’ve ended up making a Pac-Man/Bomberman hybrid with our own twists and crazy brains. Are there currently any plans to release DLC for the game in the future? [UWoS]: We will be updating the game with new game modes and levels. We have no plans to sell DLC, we just want to update it for the players for free. What do you think of the Nintendo Wii U? [UWoS]: We love playing on our Wii U. It has the best games of this generation, especially for playing with friends and family. We love Splatoon and we’ve been playing lots of Captain Toad. Do you have any other Wii U or 3DS projects in development at the moment? Thanks for answering our questions! Hopefully we'll have the opportunity to do this again sometime! [UWoS]: No worries it was a pleasure, get in touch any time! What did you think of our 40th developer's interview? As always be sure to let us know your thoughts regarding our article in our comment section below! Re: Developer's Interview: Our Discussion With Utopian World of Sandwiches Regarding Their Upcoming Wii U eShop Title Chompy Chomp Chomp Party! Our article is now live. Great interview you guys! This is what drives traffic to press websites. Happy 40th Interviersary, dudes and dudesses! Nice interview! 40 interviews is an nice Milestone, but 100 will be the first major milestone. You need to increase the number of exclusive articles on this website although the staff here does a good job reviewing a large selection of games. @Erza Still 40 interviews is a good start for such a small press website! @Ichigofan congratulations!